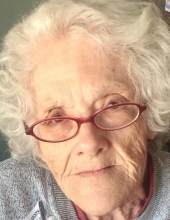 JEAN CANOY FERGUSON, age 84 of Sidney, IA died Sunday, March 24, 2019 at her home unexpectedly. Jean was born April 30, 1934 in Los Angeles, CA to Jack Charles Crawford and Yvonne Marie (Lowe) Crawford. Jean was preceded in death by her parents; husband, Melvin Ferguson; and a brother, Jack Crawford, Jr. She is survived by her daughter, Karen Rickerson and husband Kenneth of Sidney, IA; son, Gregory Ferguson of California; 12 grandchildren, Naomi, Candice, Kevin, Eric, Daniele, Adriana, Andrea, Aisli, Triston, Steven, Melissa, and Gregory, Jr.; 13 great grandchildren, Kailyn, Elijah, Andrew, Nicholas, Matthew, Kimberlie, Adam, Caleb, Nyelle, Jordan, Lucas, Liam and Izel; sister, Georgia Olvera of California; nieces, nephews, many other relatives and friends. To plant a tree in memory of Jean Ferguson, please visit our Tribute Store. "Email Address" would like to share the life celebration of Jean Ferguson. Click on the "link" to go to share a favorite memory or leave a condolence message for the family.